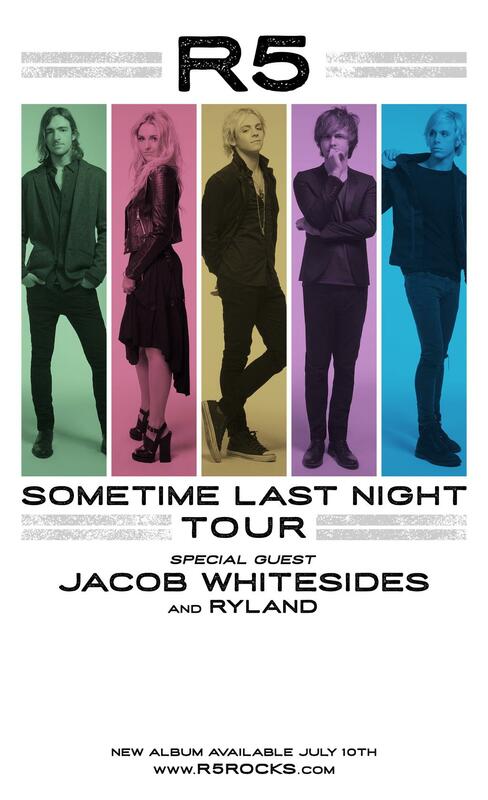 R5 has officially announced their new second album titled 'Sometime Last Night' set for release on July 10th! R5 also announced their upcoming Summer tour to celebrate the release of their new album with special guests Jacob Whitesides and Ryland! Fan Club Members (Tier 1) from April 14th 10am local time through April 16th 10pm local time. If you already have an active fan club membership, you will have first access to pre-sale tickets and VIP during this time. If you purchase a new fan club membership or renew an expired one, you will also have access to pre-sales during this time. Be sure to buy early if you plan on buying a fan club memberships in order to ensure your membership gets activated in time for pre-sales. Join or renew at R5Rocks.com/Join. Just log in to your fan club account on R5Rocks.com to gain access to pre-sales once they begin for the city/venue you wish to attend. Whether you buy or have the Online Only Fan Club Membership, or the Premium Fan Club Membership, you will have access to pre-sales. If you have any questions about your Fan Club membership please email Master Channel at r5rocks@masterchannel.com. Album Code Pre-Sale (Tier 2) from April 14th 12pm local time through April 16th 10pm local time. 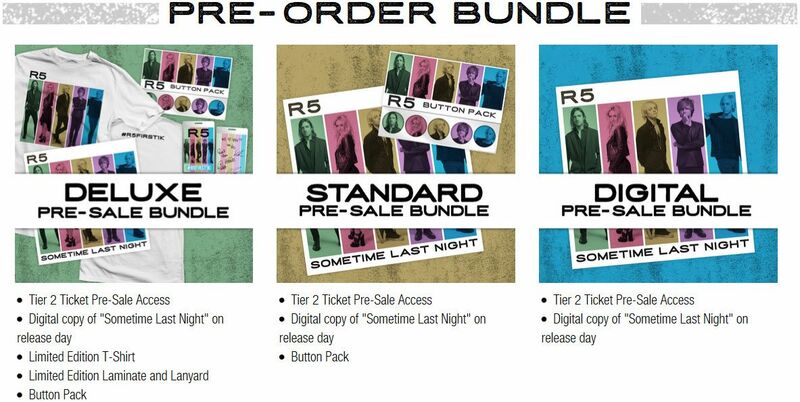 There are 3 pre-order bundles available for purchase. If you purchase any of those 3 bundles, you will get access to pre-sale tickets and VIP during this time. The merchandise included in the 3 bundles are pre-order exclusive for now. You will be emailed an access code after you purchase, just follow the directions on that email to gain access to pre-sale tickets. Pre-Sale Codes will be sent out to BOTH Fan Club members and those who purchased one of the album pre-order bundles by 12am Midnight on the evening of Monday, April 13th. You will all be set for pre-sales the following morning. If you don’t have a presale code yet you still have a LIMITED amount of time to preorder the album to get one! For all Album pre-orders order by 5:00 Central Time April 13th at presale.r5rocks.com. Fanclub pre-orders after 5:00 Central Time will receive a code on April 14th by 11:00 Central Time. If you are a fan club member or purchased a pre-order bundle and either never received your access code, or are having issues with your code, please email r5rocks@masterchannel.com and they can issue you one, or help you with the one you received. If you have a fan club membership, but also buy a pre-order bundle, that's perfectly fine! 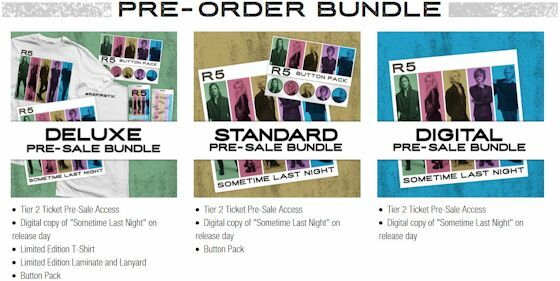 You will simply get the exclusive merchandise and digital copy of R5's new album on release day, and get access to pre-sales at both times. If you have any questions about VIP, please send an email to R5VIP@aeglive.com. More VIP tickets will be released at that time as well only on R5Rocks.com. If you have any other questions, please feel free to Tweet us or send us an email. How exciting! Will you be attending any of these shows? 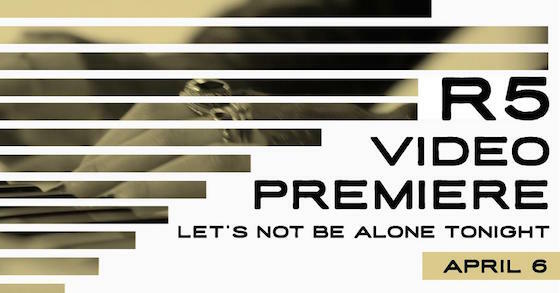 It's finally official, the video premiere of R5's hit new single 'Let's Not Be Alone Tonight' has been set for April 6th! Are you ready for it? Watch the official lyric video for it below. 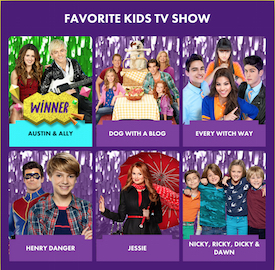 Disney Channel's hit show 'Austin & Ally' starring Ross Lynch, Laura Marano, Raini Rodriguez, and Calum worthy took home the Kid's Choice Awards win for Favorite Kids TV Show tonight at the 2015 Nickelodeon Kid's Choice Awards. 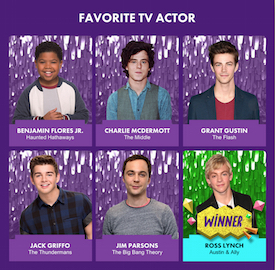 Ross Lynch also took home a win for Favorite TV Actor. Huge congrats to all for their wins tonight! The wait is finally over. Catch R5 on the big screen this coming April! Fathom Events, Hollywood Records and AEG Live present R5: All Day, All Night The Concert Event. This 1 night only special concert event will be premiering in select cinemas nationwide on Thursday, April 16th at 7pm. See the band like never before in studio and on tour, with exclusive captured live performance footage! Fathom Events, Hollywood Records and AEG Live have teamed up to bring pop rock sensations R5 to the big screen in R5: All Day, All Night. This special concert documentary event comes to select cinemas nationwide for one incredible night on Thursday, April 16 at 7:00 p.m. (local time) and includes epic concert footage, never-before-seen interviews and a look at the band from where they started to where they are now. This is the ultimate R5 fan experience, don’t miss it! Tickets are available now! Find your closest theater from the list below for this 1 night only special event. You don't want to miss it! For full details and to buy your tickets now, please click here. The nominees have been announced for the 2015 Radio Disney Music Awards, and R5 has been nominated twice! 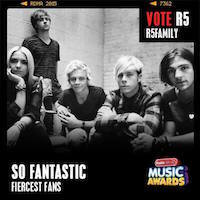 R5 has also been nominated for So FANtastic - Fiercest Fans for the R5Family! Voting is now open through Sunday, April 5th, 2015 at 11:59:59pm ET / 8:59:59pm PT. The 2015 Radio Disney Music Awards will take place on Saturday, April 25th, 2015 at 3:30pm Live at the Nokia Theatre. How exciting! 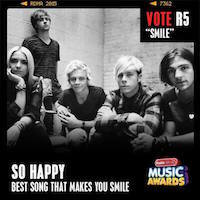 Make sure you vote for R5! During the voting period, Radio Disney listeners will have the opportunity to vote for their favorite Nominees via computer online or a mobile device at www.disney.com/RDMA (also accessible through the Radio Disney mobile app), Facebook - www.facebook.com/radiodisney, Twitter - www.twitter.com/radiodisney, and via text messaging. Each listener is allowed unlimited votes per day on each of the following voter mechanisms: www.disney.com/RDMA (both online and through the Radio Disney mobile app), Facebook - www.facebook.com/radiodisney, and Twitter - www.twitter.com/radiodisney. Each listener is allowed one (1) vote per day per category via text messaging. Anyone who resides in a country where voting in a contest is legal may vote. Standard messaging rates may apply for votes submitted via text message. VOTE VIA www.disney.com/RDMA: Participant listeners may look at Nominee photos, watch Nominee videos and vote unlimited times per day at www.disney.com/RDMA online and/or through the Radio Disney mobile app. VOTE VIA FACEBOOK: Participant listeners may vote unlimited times per day via computer and/or mobile device at www.facebook.com/radiodisney. VOTE VIA TWITTER: Participant listeners may vote unlimited times per day via computer and/or mobile device at www.twitter.com/radiodisney. Valid voting via tweets will include @RadioDisney, the predetermined hashtag of each category, and the Nominee name (further details and category hashtags will be on www.twitter.com/radiodisney). Misspellings will not be counted. Artist hashtags are not casesensitive. Retweets shall count as a new vote for the Nominee & Category specified in the original tweet. You must post the tweet as public in order for it to be included. Any tweets from a Twitter account whose privacy setting is “private” will not be counted. Please note that disabling “protected or private mode” will make all of your tweets/posts public and anyone will be able to follow you. VOTE VIA TEXT MESSAGING: Participant listeners may text “RDMA” to 347639 one (1) time per category per day. Multiple texts will be necessary to vote for all of the categories. Data is gathered and added to the data collected online and from mobile devices to determine Nominee winners. KIDS AND PARENTS PLEASE NOTE: Standard carrier-messaging and data fees may apply to each text message sent and received. Kids ask your parents’ permission before texting. There are no premium charges attached to these texts. Text messaging may not be available in all areas. SMS Voters will receive a confirmation SMS text message on their Cell.